With just two months left in his term, UN Secretary General Ban Ki-moon’s administration is scrambling to compensate, for the first time, the victims of cholera, with a plan to give them or their communities cash payments from a proposed US$400 million cholera response package. “He also wants to make good on an unfulfilled promise to eradicate cholera from Haiti as the disease continues to claim lives,” says a report in the New York Times. The report notes that ever since United Nations peacekeepers introduced a devastating cholera epidemic to Haiti in 2010, Ban has insisted that the global body is immune from legal claims. But while, in the past few months, Ban has acknowledged a “moral responsibility” for the epidemic, he has stopped short of saying sorry, the Times said. Close to 9,500 Haitians have died from cholera and hundreds of thousands have been sickened, with the disease surging in the aftermath of Hurricane Matthew. The proposed package follows the first acknowledgment by the United Nations, in August, that it played a role in the initial outbreak of the disease, in October 201. The Times said the acknowledgment was made after a scathing report by independent United Nations human rights adviser, Philip Alston, denouncing what he called the organization’s years of silence and denial. The admission also came just before a US federal appeals court in New York upheld the immunity of the United Nations from prosecution under a longstanding diplomatic treaty. “We want to do this because we think it’s the right thing to do for the Haitian people, but frankly speaking, it’s the right thing to do for the United Nations,” Jan Eliasson, the United Nations deputy secretary general, told The Times. Whether the proposed package will satisfy Haitian victims and their families who have unsuccessfully sought to sue the United Nations in the United States remains unclear, said the paper, stating that lawyers for the victims have not yet decided whether to pursue further appeals, including to the United States Supreme Court. About US$200 million of the package is meant for what United Nations officials call “material assistance” to families and communities that were most affected, the Times said. 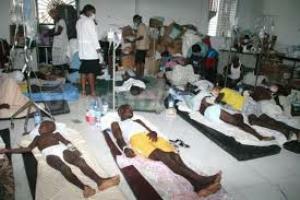 It said the other US$200 million would help pay for cholera eradication and improved sanitation. However, the officials avoid the term “compensation” partly over fear among donors that it could set a precedent.